The wide variety of walks available locally offer something for both the beginner and the experienced walker alike. Magnificent views, magical sunsets, moonlit nights or dark night skies and birdlife in its natural habitat are inspirational for any photographer, outdoor enthusiast and adventurer. Whatipū is to be enjoyed rain or shine. We look forward to seeing you over the summer at Sir Bob Harvey's favourite place to stay. Whatipū is beautiful, wild and remote with significant Māori associations and many historic sites. There are documented five pā sites, middens, karaka groves and earthworks for gardens recording Māori occupation. Te Kawerau ā Maki are acknowledged as retaining the mana whenua of their ancestral domain. Whatipū Lodge is privately managed by Peter and Ursel. 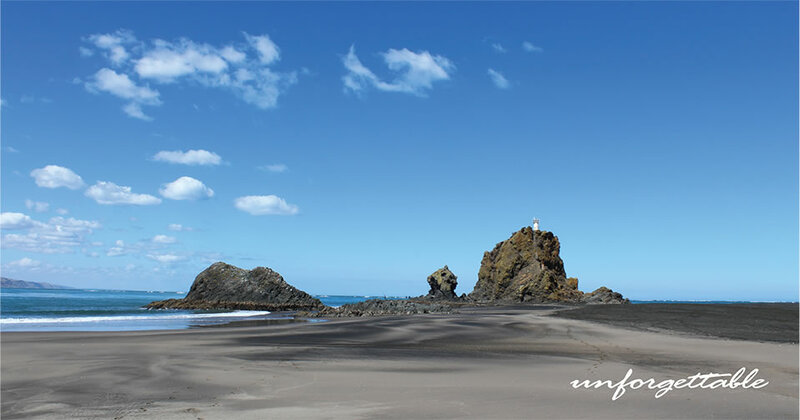 Whatipū is a scenic journey 42kms from Central Auckland and 25kms from Titirangi Village. Available activities include TRAMPING, WALKING, FISHING and exploring the nearby caves, dune areas and wildlife sanctuary. There is no surf patrol at Whatipū. Auckland Council warn against swimming. Special care should be taken when fishing or exploring. Friends of Whatipū (FOW) is an incorporated group who have knowledge of and links with the Whatipū area and have resolved to act as guardians of the area, helping to preserve its special character and where possible assist the Auckland Council. FOW have an annual planting day, beach clean-up, seed collecting and a group stay at Whatipū Lodge. Our stay at Whatipū Lodge has a guest speaker and shared Saturday night meal. FOW have a long term goal to release kiwi in the Whatipū landscape. It is our intention to be trained for best practise predator control, to rid the region of mammal pests, including, opossums, rats, mustelids (stoats etc), wild cats and for dogs to no longer be taken into the area. Dogs are already banned from the Whatipū Scientific Reserve (being the wetlands and beach area) and yet people still continue to take dogs to the beach. Kiwi once thrived in the region. FOW manage a survey of shorebirds and help fund an ongoing predator trapping programme, in cooperation with Auckland Council. There are about 6 pairs of New Zealand Dotterels found on the tidal dune area of the beach between Whatipū and Karekare. Over 10 years of monitoring FOW have recorded 31 fledged NZ Dotterel chicks. The estimated national population is approximately 2000. To join Friends of Whatipū please email [email protected] for details. $10 for individuals and $15 for families. For more information see our Facebook page - linked here - Friends of Whatipū.